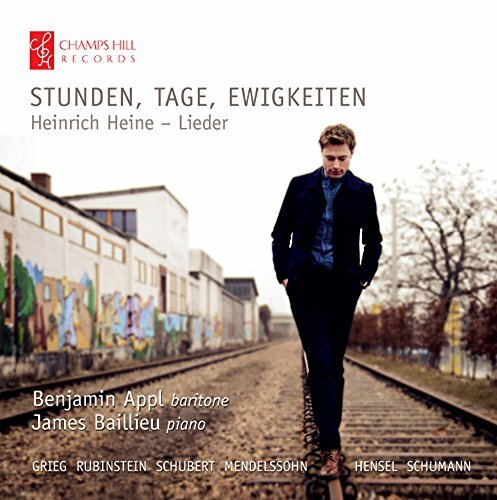 Currently a BBC New Generation Artist, baritone Benjamin Appl makes his Champs Hill debut with a disc of lieder by Grieg, Rubenstein, Schubert, Felix & Fanny Mendelssohn and Schumann. All composers set words by Heinrich Heine, one of the most contraversial literary figures of the last 200 years, whose texts still have surprising relevance today. Benjamin Appl was greatly influenced by Dietrich Fischer-Dieskau, who mentored and taught him as his last private student until his death in May 2012. An accomplished performer in opera and beyond, he is an extablished recitalist, performing in Carnegie Hall and the Wigmore Hall, where he was named as an ‘emerging artist’ in 2015. Described by The Daily Telegraph as ‘in a class of his own’ James Baillieu is a prize-winner of the Wigmore Hall and Das Lied International Song Competitions, and the Kathleen Ferrier and Richard Tauber Competitions. He was selected for representation by Young Classical Artists Trust (YCAT) in 2010 and in 2012 received a Borletti-Buitoni Trust Fellowship and a Geoffrey Parsons Memorial Trust Award.